Natural Spaces. Wild Places. Landscape Art by Warren Peterson. : Brushwork Through Thick or Thin. Brushwork Through Thick or Thin. There comes a time in a painter's life that the brush seems to take on a life of it's own, especially when painting en plein air. Lots of practise and many mistakes imprint themselves over time, making your instinctive handling of a passage look easy to some but all those maddening and wonderful mistakes add up to confidence with a brush especially when chasing the light outdoors. Those strokes also seem to take you to another place when you're back in the studio working the sketches up into larger works, so much so that when you stick your nose into the finished work you sometimes say to yourself "how did I do that?". I'm going to spend some time on this blog looking at how brushwork, with a loaded brush or in a thinly painted passage, can add substance to your paintings in the field or back in your studio. I've taken sections from a few of my works ( you can see the whole paintings in my web site linked via About Me to the right) that in their own right could be assumed to be full works on their own. Click on each image for a larger view. Look at this detail to the left. After loosely painting in the tree trunk I took my mid value green and laid it on to establish the main masses. This was a nice summer day with some wind so I wanted to highlight the haphazard growth on this old pine and the storm damaged broken top. Next I took a green on one side of the brush and another lighter one on the other side. Applying the darker side with a sweeping motion laid in a good strong background on top of which I quickly applied the lighter green very lightly to pick up the darker under colour. I moved on to other sections to let this dry. While doing so the light changed a bit, throwing some deeper shadows under the branches. I liked this and added the darkest strokes to capture that moment. 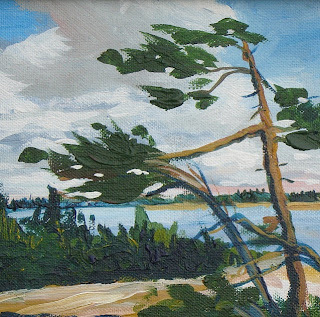 Detail - Breezy Day. Private collection. You have to work fast at this with acrylics and, as I said earlier, it takes some practise but the sweeping, loaded brush effect can add a lot of depth. Your brain can add in the details. This is another example and the "thick over thin" method can be seen here. I usually work from background to foreground, top to bottom so I can overlay the various passages. This was a very windy day and I painted the clouds first in thin washes of blue, gray and white for this section. The loose brushwork in the clouds adds movement to simulate the wind direction. After laying in the tree trunk I took a very loaded brush and carefully added the wind-swept branches and needles of this very old pine in the same direction as the clouds. A light, stabbing upward motion with the brush, coupled with holding it horizontal provided some happy notes on the board. I was in the moment. 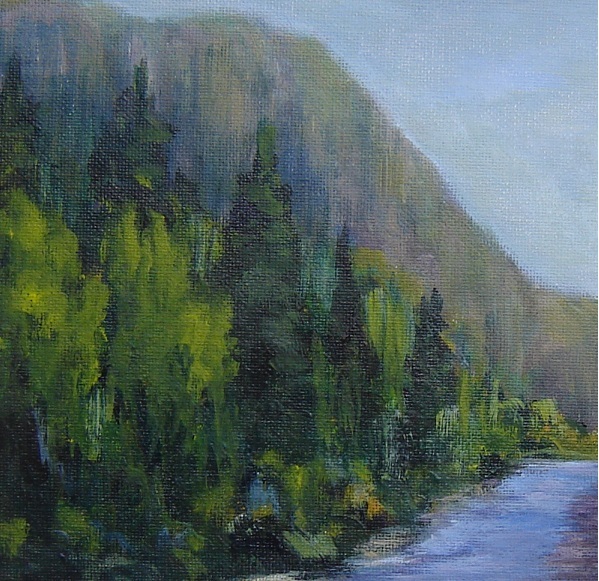 Detail - On the Agawa. Private collection. When travelling I usually take about 6-8 colours with me. You never know when one will work better than another. I do have standard palette. 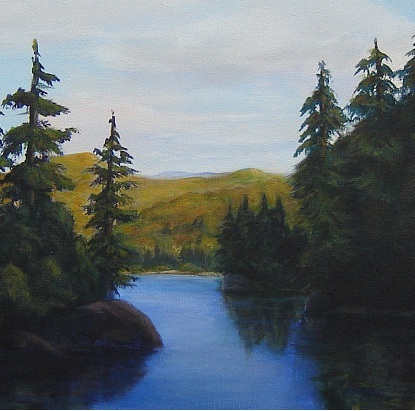 For this painting to the left I only took my 4 basic palette colours as the location, the Agawa Canyon, is located in a very remote area. I had Cadmium Yellow Light, Ultramarine Blue, Alizarin Crimson and Titanium White. This detail is from a painting that was done in about 90 minutes as I had to catch the train back to the city. After laying in the sky and a darker value for the distant mountains in this canyon I went to work on the mixture of hardwood and pine trees. I worked from background dark trees to mid-ground light to foreground dark again. 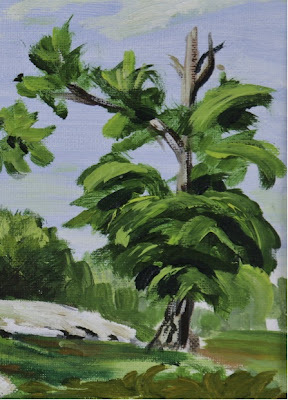 I used a different brush technique on the light green trees by taking a loaded brush, holding it at the tip of the handle and slowly let gravity take over as I gently let it drag from top to bottom holding the brush parallel to the board. I carried the green as a light wash over the distant blue hills to create their treed tops. Keeping your paint passages thin, that is without impasto, is a great way to simulate distant places in the picture. These pull you eye back and when combined with receding values give the illusion of depth on a two dimensional surface. Here you can see how I modulated the background hill with values and various shapes in the brushstrokes to show their underlying structures, vegetation and shadows from the clouds, whose shapes were first blocked in with gray and overlaid with a light white/blue mix. By pushing the clouds shapes around from up-sweeping brush strokes and dabbing semi-white highlights you can get a nice transition between the darker belly of the cloud and the lighter tops. Adding the darker trees at the lake edge further enhances the distance between the lake and the hills. 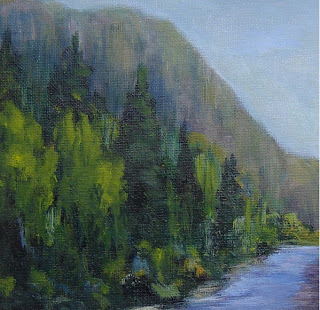 Detail - Spring Morning Algoma. Private collection. Holding your brushwork in reserve is a specific strategy that you can use to ensure that the mood of the painting and its emotive statement is conveyed to the viewer. The detail to the right is from an 18"x24" painting where brushwork was subordinated to colour value and shapes. I wanted a more slick surface in the final painting to give the viewer a chance to set themselves on the shore and look to the distant hills that are too far for details. Your eyes fill in those distant details. 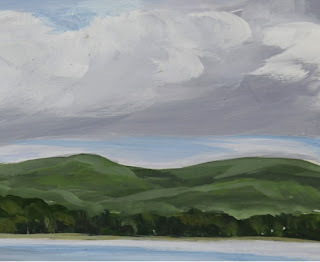 The mid-ground shadowed areas act as a foil to draw your eye to the sunny hills and lighter foreground in the finished painting acts as a step into the picture. You can view the full painting images on my web site via the About Me section at the top right. You will find them in the Plein Air and Archive galleries and can click on them to enlarge. While there take a look at the Demonstration page to see more of my technique.